Champagne Shores is the perfect villa rental for design lovers. The sea-facing wall is made up of huge panes of glass from top to bottom, and the terrace is made of cool, whitewashed stone. Inside, rich wood panels and crisp white interiors add to the chic, modern vibe. It’s smart, stunning, and beyond upscale. You’re bound to stay entertained, between the media room, private gym, and sleek swimming pool. To top it all off, Champagne Shores is minutes from the Blowing Point Ferry Terminal, Anguilla International Yacht Club, and several beaches. Private waterfront villa overlooking Pelican Bay! 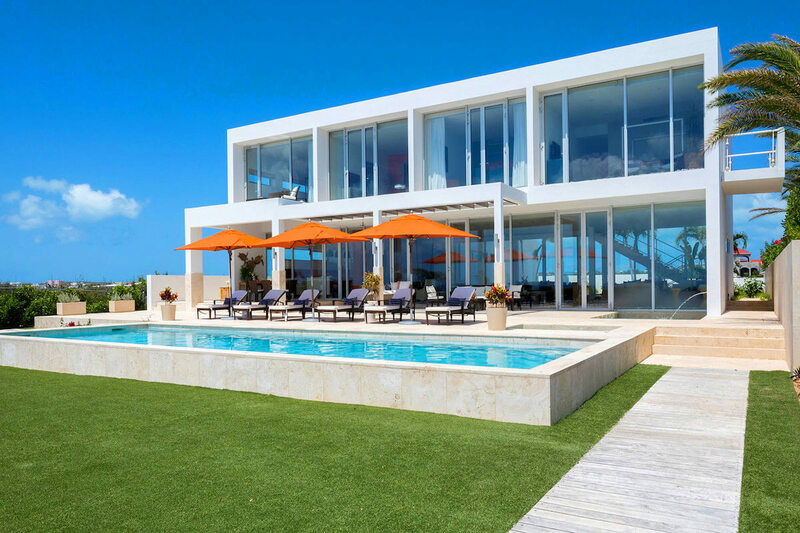 Champagne Shores is a modern waterfront villa surrounded by the mountains and sea in Blowing Point, Anguilla. Any special event, from a corporate retreat to a wedding, will be elevated in this spacious, fully air-conditioned villa. Outside, the expansive deck stretches towards the sea, with a lush lawn spanning the gap between villa and sea. A pool sits nestled into the deck, a square fountain across the walkway and a hot tub nearby. Grilling on the BBQ is an easy way to feed large groups, and there’s dining tables inside and out for guests to enjoy their meals around. Lay out on one of the loungers or relax into the day bed up on the balcony to soak up the tropical sunshine. Manicured hedges border the perimeter and sit between Champagne Shores and its sister villa, Beaches Edge East. Champagne Shores is breezy and luxurious, with wide open glass walls facing the sea. The airy Great Room incorporates the lounge and dining area into one space and opens to the terrace and front courtyard. Guests can watch TV from either of the sitting areas, or feast around the glass-topped dining table. The European kitchen is decorated with flat-panel, white lacquer cabinets, sea-glass inspired countertops, and travertine stone flooring. It’s equipped with a Dacor built-in oven, Thermador gas cooktop, Gaggenau exhaust hood, Miele dishwasher, sub-zero refrigerator, wine cooler, and a double-bowl sink with a deep basin. The main floor king suite has a view of the lush, tropical gardens, an ensuite bathroom with a walk-in rain shower, a lounge area, and a TV. Two identical king suites sit on either end of the upper level, with two guest suites in the middle. All four bedrooms have huge glass windows that face the ocean view. The king suites each have their own balconies, lounge areas, flatscreen TVs, and ensuite bathrooms with soaking tubs and rain showers. The guest suites both have a queen-sized bed, seating, and an ensuite bathroom with a rain shower. There is also daily maid service, so Champagne Shores feels like a hotel without sacrificing privacy. Champagne Shores can be rented individually or with its sister property, Beaches Edge East. Larger parties can rent the villas together for an exclusive, private retreat that sleeps over 20 people. Both villas are fully air-conditioned, and are just a 2-minute walk to Pelican Bay. These properties, together or separate, are perfect for extended gatherings, wedding parties and ceremonies, reunions, and corporate retreats. pool size 15 ft. x 42 ft.
A short two minute walk down a path to a tiny secluded stretch of sandy beach on beautiful Pelican Bay. The villa was beautiful, clean, very well appointed and equipped. Housekeeping was excellent. Lilian, the houskeeper, kept the place immaculate, washed our clothes and even ironed. We hired chef Samanta to cook 3 dinners for us. It was a real treat! Fish, lobster, ribs/chicken on the grill with dessert too. All delicious. She was delightful! The kitchen was gorgeous, very well-appointed. Loved the beaches…Rendezvous, Shoal Bay, and Meads Bay. (Straw hat restaurant was great, good service for chairs and umbrellas; enjoyed an evening of entertainment at Anacaona Hotel ). The dirt road to the villa has many deep pot holes which I learned is not unusual on Anguilla. The ladies in the family enjoyed the hot tub at villa. The pool was about 3 feet deep, temperature was fine. The lighting in the villa and the landscaping was beautifully done. The view was terrific looking at the mountains of St. Martin, especially at night. There was a walking path to the basically non-existent beach near the villa. It wasn’t even appropriate for snorkeling. Working with Shawna was a 5-star experience. It was delightful dealing with her.